Hello Duelists! The North American World Championship Qualifier is only a few days away, and we have a pretty big advantage as we get to see the results from the Central American World Championship Qualifier. Probably the most interesting thing from the CAWCQ was the winner's deck. Before I start I would like to congratulate Galileo Mauricio De Obaldia Soza on winning the event! Thank you to United Gosus for providing his list. Solemn Scolding first started to see play in the Nekroz deck at YCS Chicago but it stopped seeing play around the time Lose 1 Turn was released. When Lose 1 Turn was released Nekroz players began using Mystical Space Typhoon in the maindeck again. Now on the surface that doesn't seem like anything special or something that will change your build around, but it was. The reason that scolding was so good is because your opponent needed 2 outs to the Djinn lock but when Nekroz players began using Mystical Space Typhoon in the maindeck again, instead of needing 2 outs to Djinn lock your opponent needed 1 out and a Mystical Space Typhoon. Another thing that Scolding did was make Mystical Space Typhoon live in the Nekroz mirror, so instead of your opponent starting with 1 dead card in his hand, if you opened Scolding, your opponent just took a card away from both players. Another problem with Scolding is that it only really shines when you have the Djinn lock. 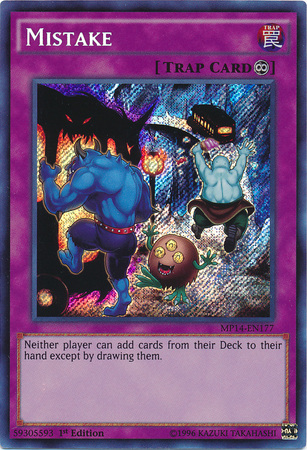 Sure it has some other miniscule uses such as being able to stop Valk or stop a Spell, but it's main application is protecting the Djinn lock. So when you have a brick hand guess what card will probably be in your hand? Scolding. Scolding doesn't exactly fix bad hands, it just makes good hands better. Instead of playing the Scolding you can replace the Scolding with a card that would increase your consistency, such as Upstart Goblin. What happens when your opponent has an out to your Djinn lock before you've even set it up, such as Effect Veiler or Artifact Lancea? Now, unless you're able to summon Valk you're stuck with a measly Lavalval Chain and Scolding which probably won't protect you from the onslaught that's about to happen. Maxx c is also very strong against a Scolding variant of the Nekroz deck because if you open Scolding and a way to Djinn lock your opponent you're probably going to go for it, and if your opponent drops Maxx C and you still go for it then they're going to end with a minimum of 8 cards in their starting hand, which greatly increases their chances of having at least 2 outs. It's not very feasible to stop going off because even though you can stop Trishula next turn with Scolding it probably won't affect your opponent too much because you'll still be very far behind. In conclusion I do disagree with Galileo on his inclusion of Scolding because it makes your opponent’s Mystical Space Typhoon's live, so instead of them having 1 less card to play with, both players now have 1 less card to play with. The main factor that may lead in the other direction is that the sheer power of Solemn Scolding may be enough to completely outweigh the negatives, which is probably the conclusion that Galileo came to and chose to use it. This is another very interesting idea that I would have to disagree with. Mistakes were sided for the mirror match (more than likely). What you would do with it is summon your monsters, search as much as you can that turn, and then on your opponents turn flip Mistake so they can't do much without a ritual spell. 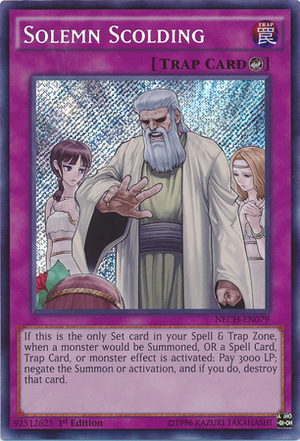 Now some might compare Mistake today to Royal Oppression back in Teledad where you play Yugioh first then on your opponent’s turn you don't let them play Yugioh, but there's a big problem that occurs when you're trying to do that with Mistake. If your opponent opened a couple of ritual spells he can still play the game, and when you flip Mistake the game essentially becomes who can keep the biggest monster on the field. Also, if your opponent has a way to summon a ritual monster and has Raigeki you're in trouble since you can no longer search either. If your opponent can clear your board then you're probably not gonna be in a good position. Another problem with siding 3 Mistake is that it isn't very good in multiples, as you wouldn't want to open 2 Mistake since odds are that your opponent doesn't have an out to the first one anyway. The argument can be made that you want to see one as much as possible so you should side 3, but I feel that the cons of opening 2 greatly outweighs the need to see just one. I would not recommend siding Mistake at the upcoming NAWCQ because it isn't as much of an autowin as it initially seems. If you do choose to use it I would highly recommend testing it a lot just to make sure that you still feel it's good, and maybe even building your side-deck in a way that supports siding into it. That's all for this week's article! Special thanks go out to Adam "Satellarknight King" Cisneros for giving me this week's article topic! If you'd like to see me write about a certain topic feel free to message me on Facebook. The Circuit Series stops by Charlotte, NC next on July 18-19! I hope to see you all there! And As Always Play Hard or Go Home!